You don't need mikes, mixing desks and digital music to do audio engineering. In the 17th century they did it just with rainwater. At least that's what a 17th century French audio engineer called Grillet, did for the 1st Duke of Devonshire. Grillet was hired by the Duke to create a water feature for his garden - not the kind of water feature you buy in garden centres nowadays but a gigantic architectural feature. After all, the garden in question wasn't out the back of a suburban semi, but the hillside garden behind Chatsworth: the grand Derbyshire stately home of the Devonshires. Grillet applied his previous experience working for the Sun King, Louis XIV of France to create a waterfall with an Audio twist. 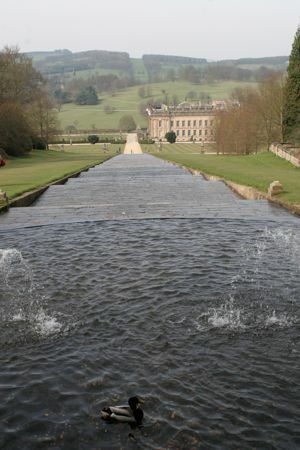 The resulting 'Cascade' is an artificial stream, dropping a full 200 feet, from the hillside above down the garden behind Chatsworth House. 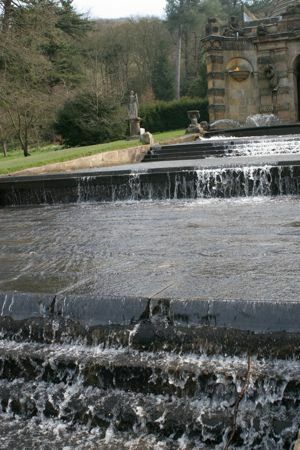 It consists of groups of steps, each designed so that as you walk up the cascade the sound of the water subtly changes. Of course this wasn't done with some amazing advanced technology. After all it was the late 1600s so all that was available were stone-masons, his engineering know-how and a good dollop of creativity. He created the effect by structuring each group of steps slightly differently. He varied the number of steps in the group, their heights, distances apart, and also added features like ledges or rounded lips. The result is that the water makes a slightly different sound as it flows over each group. That means as you walk up the path besides the cascade, you find you are walking through a gentle, natural but designed soundscape. The cascade is much greener than much of our modern audio-engineering too. It produces its effect without the need for a power guzzling energy source as it is gravity-fed by rainwater from a man-made lake at the top of the hill. Today's audio artists make use of modern technology to create all kinds of wonderful effects, but it is worth remembering that sound art can be created just by working with nature...even if you then wonder what you could do by combining digital effects with a cascade.